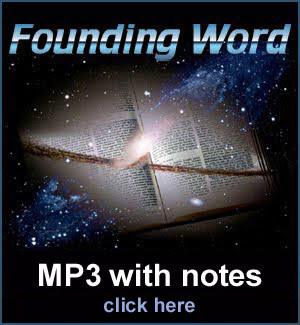 www.FoundingWord.com is for the exclusive publication of recorded MP3 files of verse-by-verse Bible commentary and study notes. Feel free to check it out and download all you want. Right now we're going thru a synchronized study of Matthew, Mark, Luke & John. We've often heard it said that you can't take it with you when you die. But in Matthew 6:19-21, from the Sermon on the Mount, Jesus taught that IT IS possible to send it on up ahead of you by laying up for yourselves treasures in Heaven where neither moth nor rust can corrupt and where thieves do not break through and steal. How is this done and how is it even possible? What are the treasures of Heaven? Jesus wasn't speaking metaphorically, but literally, as he emphasized the laying up of these treasures as if they were piling up and increasing. To further emphasize their reality and their incredible value, he said "For where your treasure is, there will your heart be also." What are these treasures and how do you lay them up?